I first met Jean-Francois Mertens while I was a graduate student at the Hebrew University of Jerusalem . He often visited the Center for Rationality at the Hebrew University and in one of those visits Abraham Neyman, my Ph.D. adviser, asked Mertens to sit with me and listen to my research. Mertens has contributed to several areas in game theory. His paper with Elon Kohlberg on stability of equilibria has opened a new research area. His work with Shmuel Zamir on the universal belief space is fundamental and complements Harsanyi‘s work on belief hierarchies. His study of the min-max value and max-min value in general repeated games had a huge influence on the research in this area. The Mertens conjecture on repeated games with signals, stating that in zero-sum repeated games with signals, whenever player 1 knows everything that player 2 knows (that is, the signal of player 1 contains the signal of player 2), then the limit of the n-stage game converges to the max-min value, has been the starting point of many works in this topic, and is still open, though recently some advances has been made to solve it. His contribution to the Shapley value in games with continuum of players includes the extension of the diagonal formula, that historically applied to smooth nonatomic games, to a larger class of games that includes nondifferentiable and also discontinuous games. 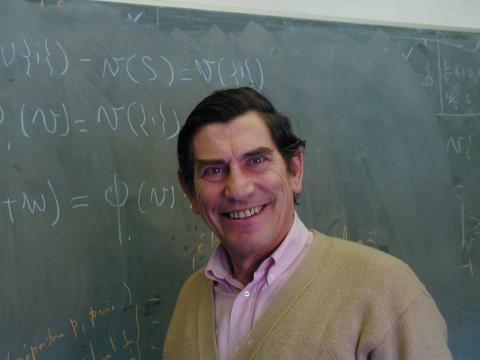 For me, his most significant contribution is to the area of stochastic games, where he proved, together with Abraham Neyman, that every two-player zero-sum stochastic game has a uniform value. When Mertens and Neyman proved this result I was still in elementary school. The story I heard about the inception of this result is that in a workshop at CORE on repeated games in the Winter of 1978–1979, Sylvain Sorin was giving a talk on the Big Match, which was the first nontrivial two-player zero-sum undiscounted stochastic game that was solved. For Abraham Neyman, who was sitting in the audience, this was the first encounter with repeated games and stochastic games, and so he asked many questions, ranging from basic to ideas of extending the result to general stochastic games. Jean-Francois Mertens, who was sitting in the audience as well, patiently answered Neyman’s questions and explained why each route that Neyman suggested to extend the result is bound to fail. Like two swordmen, Neyman made another suggestion and Mertens fended it off. The result of this match was one of the most beautiful papers in game theory.